There is no denying that Deepika Padukone and Ranbir Kapoor do look cute together! Their sizzling chemistry on the silver screen has always made fans always rot for more of their projects. Even though the ex-lovers have moved on successfully in their personal lives, they continue to be thick friends and thorough professional co-stars! The duo was once again seen setting the stage on fire with their fun camaraderie at the Asian Paints night event. Ranveer Singh Smitten by Deepika Padukone's Wax Statue at Madame Tussauds Is the Best Thing on Internet Today. DP looked gorgeous in a pink floral gown and RK was his handsome, dapper self! 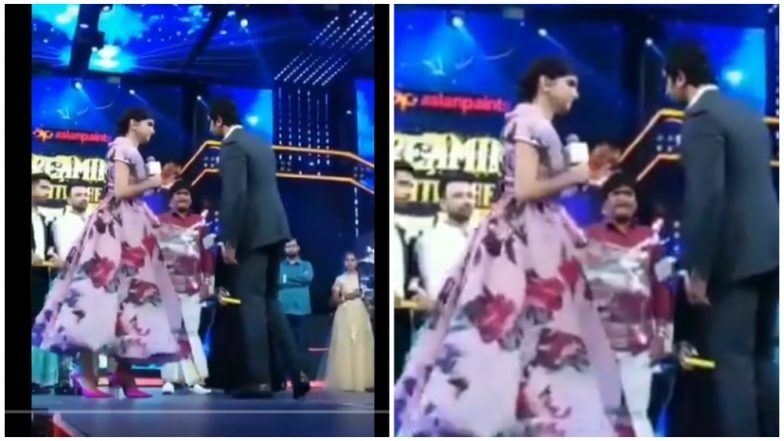 The event was hosted by comedian Bharti Singh who left no chance to pull Ranbir and Deepika's leg while hosting. Also present was Karan Johar who joined in for this entertaining event. They also danced together on Ranveer Singh's Aankh Maarey. Oh, how we wish to see DP, RK and Simmba in one film together! Check out the pictures and videos below. Deepika and RK's Fan Cheering Competition! We Need Their Movie Soon! Recently, Ranbir and Deepika were seen in a goofy, light-hearted commercial that was for the same paint brand. Their chemistry pierced through the TV screens, making the fans want to see them in another flick soon. These pics and videos too make fans demand a full-fledged movie starring them and we hope that the makers make it happen. After all, Yeh Jawani Hai Deewani and Tamasha are the fine examples of the massive fanbase of this pair. Wouldn't you like to see them in one more film again? Root for them in the comments section below.